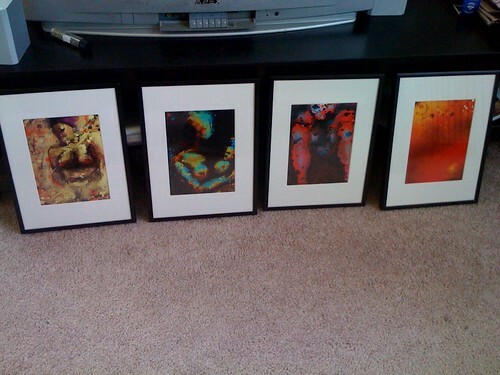 As an experiment, I took 4 of my older abstract pieces that were not at all ready for printing. The images had not been retouched or resized. I simply uploaded them from my phone to email, saved the images to a flashdrive, and lazily walked it over to my local Kinko’s. I requested that each print be resized to 6” x 8” and printed on 8.5” x 11” poster paper (in this case, glossy). The quality of the print was quite nice. We played around for a bit with other sizes and paper, but I found that the 6×8 on glossy created the best quality print of my images. There was a bit of pixellation, but not too noticeable as the works were abstract and “unclear” in effect. This process only costed me $22.00. The prints, by themselves, were only $1.29 a piece with an additional fee for resizing (and the billions of hoops I had my very helpful rep jump through as a result of me changing my mind and wanted to test everything). Note: To save even more, you could resize the images yourself. The result? See above. Quite nice. Looks beautiful mounted as a series on a wall; or even better: ready gifts for the upcoming holidays. Enjoy! This entry was posted on Tuesday, December 8th, 2009 at 19:23and is filed under . You can follow any responses to this entry through the RSS 2.0 feed. You can leave a response, or trackback from your own site. Great Job and post Mia. I find it very rewarding playing with the printing process. It’s almost as much fun as creating the original art. And for some really cheap, front drop in (no matt) frames look here. They’re really great. Leave a little white boarder when you print ad you’re all set. I’m going to be re-creating your process of making prints and wanted to know how you save the images before going to Kinkos; i.e. TIFF, JPEG, etc? I had a few 6×8 prints made at a local Kinkos today and they all turned out great except for one so I will go in and fine tune that but all in all a success, thanks for the idea. Tomorrow I’ll find mat and framing. I’m trying to make sure I progress with ‘Brushes’ so I’m eventually making money with these creations, not just some more nice prints sitting around gathering dust. It needs to be serious business once it leaves my studio. For me that means creating exhibits at galleries that represent me and marketing this new way of creating so those that normally buy my originals will want these also. Thanks again for your idea to make it simple and just see how it goes. Because I’ll be selling these prints, I will be researching an inexpensive but archival way to print them. I asked the Kinko guy about the longevity of the inks and he didn’t really know so I’m guessing there must be another way to present them to the public with a good conscience about them lasting a long time. Will pass along any info I get about this. Thanks for the post. I had also tried kinkos as well with good results(some color inconsistencies). I did find that with brushes, you can export to TIFF and in photoshop resample to be a 6″x9″ @ 300dpi. Prints great, no pixellation or distortion. I started mounting them to hand built wooden boxes. I used the Golden spray varnish to add a layer of UV protection and longevity. I now print out on archival paper with my Epson Stylus Photo R1800 and it is even better than kinkos and the colors are spot on! Thanks for the additional info Jonathan. What brand is the Golden spray varnish? I’ll look into the Epson printer also. The finished prints look good in the exhibit you linked. Hi folks, if you can find a printer that does pro quality ink jet it can be quite cheap. Here in the UK you can get an A3 print for £5 & it gets cheaper the bigger you get, so you could combine your images an an A1 sheet for example and cut them down to size. Epson have some fantastic papers, maybe the most commonly used for art prints being Archival Matte. Most good printers will stock this. It has no gloss so you’re not getting reflections and the colours are deep & rich. The colours should last for about 100 years as your printer should be using pigment inks. Ink jet technology at it’s best has already surpassed what can be produced by traditional silver halide printing and if you’re doing a lot of printing you can get a printer of this caliber for £400 (A3), though the media isn’t cheap (and unless you get your kit calibrated properly you’ll be spending money on ‘trial’ copies), you get more control over the print. For instance Archival Matte has a tendency to take out some shadow detail but if you’re working with it regularly you get to know how to compensate. For someone looking to work professionly it’s either this option or building up a sollid relationship with a good printers. In any event getting your kit colour calibrated would be a good step at some point. Good luck! Oh, one other thing, if you’re upsizing in Photoshop use the downsizing algorithm, some books tell you this isn’t s good idea, but test it yourself, the results are better.